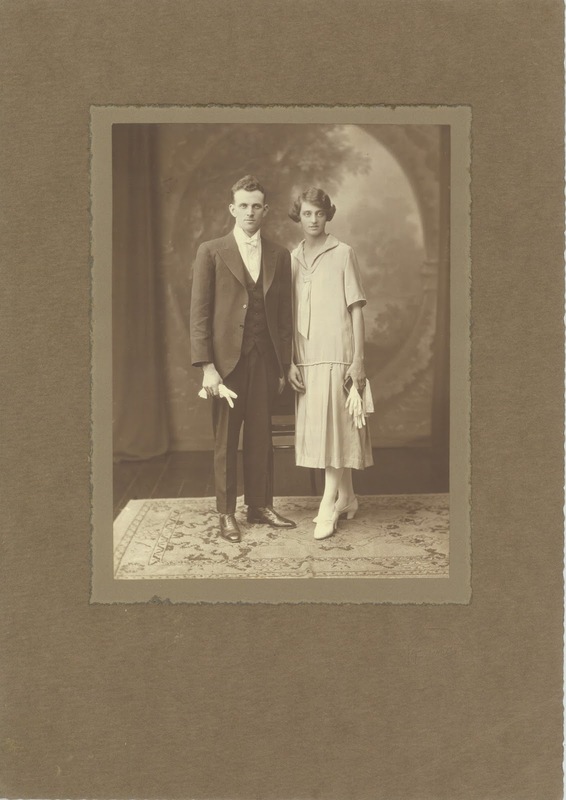 "Mr and Mrs Ellis Stewart"
For a long time past the Karangahape Road area has been much in need of an up-to-date photographic studio. This long-felt, want has now been supplied with the opening of a thoroughly-equipped modern studio. The "Bell Studio," as it is named, is situated in the heart of Karangahape Road in the building previously occupied by Tadema Studio. The studio has been thoroughly renovated and equipped with the latest appliances both for day and evening portraiture. No expense has been spared in making the premises restful and desirable in every way. The general equipment of the studio is really unique. An imposing doorway gives entrance to a lobby where several fine photographs are on view. The waiting room upstairs is furnished in the best of taste and has a comfortable, cheery appearance. The fittings of the studio itself have been designed to give the best service. The lighting effects have been well arranged, and the absence of any glare is assured. All kinds of portrait work are undertaken, and no one branch is featured. The arrangements are so carried out that any variety of work may receive attention. Patrons may rest assured that whatever their requirements they are sure to be met satisfactorily. The present time is very suitable for having one's portrait taken. What better than to have a photograph of oneself ready for the new year to show one's friends. Every care is taken by the Bell Studios that all work is the best that modern photography can accomplish. Although the firm has been established but recently already its work is becoming well known. There is no doubt but that the excellence of the work will ensure an ever-widening connection. Strict attention is given to a policy that every portrait sent from the studios should be an advertisement by reason of its true likeness. The studio has been fortunate in securing the able assistance of Mr. Victor R. Millard, who will act as managing operator. Mr. Millard's high qualifications and reputation as a photographic artist, both in New Zealand and in Europe, require no further mention to commend them. It may be added, nevertheless, that Mr. Millard enjoys the unique distinction of having recently, received the decoration of the French Academy of Fine Arts in recognition of his book on advanced portraiture - a work which now lies in the National Gallery of France. The proprietor of the studio, Mr. Arthur Bell, remembered by many for his admirable portraits of men, will be pleased to renew acquaintance with his former clients.